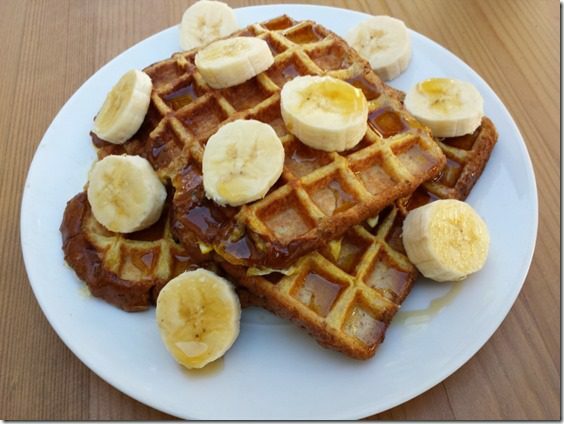 I don’t know why all waffles aren’t made this super easy and amazing French Toast way! Unfortunately, I didn’t have a donut. 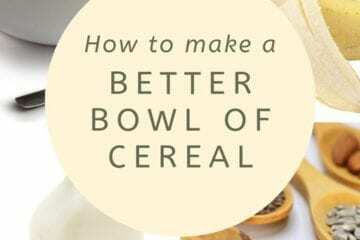 But I did have an amazing breakfast idea! 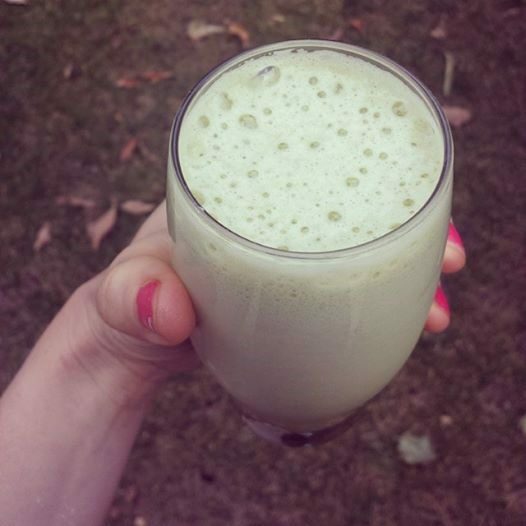 And I woke up and had a green smoothie to quiet the hunger while I made it. Today’s a rest day so I started the day with a walk. My right knee is a little sore from the race, but outside of that I feel good. Now I have to share the most awesome breakfast I had on Saturday! 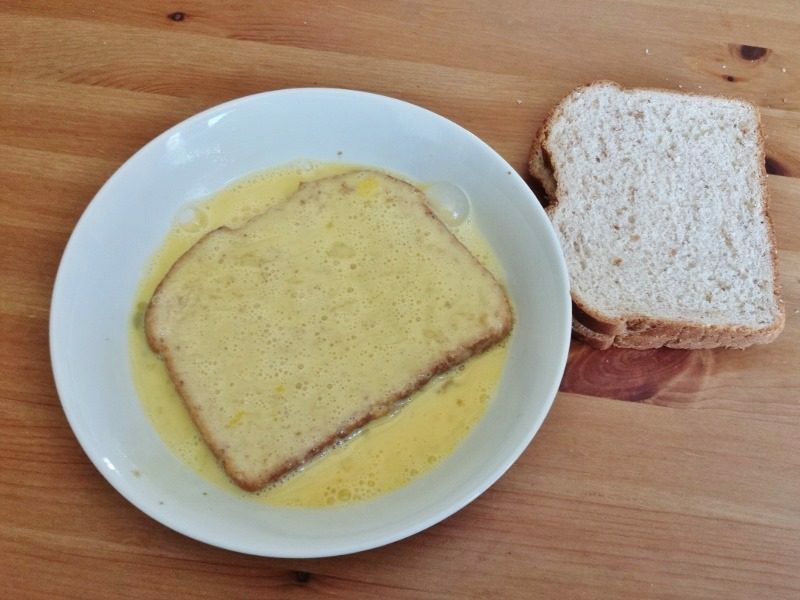 IT WORKED and was delicious! I love waffles, but don’t usually make them because they’re more work than pancakes. Well, these French Toast Waffles are less work than pancakes! Mix eggs and milk, vanilla, salt, cinnamon. Dip bread in egg mix – both sides. Place bread in waffle maker (sprayed with non-stick spray). Cook through. 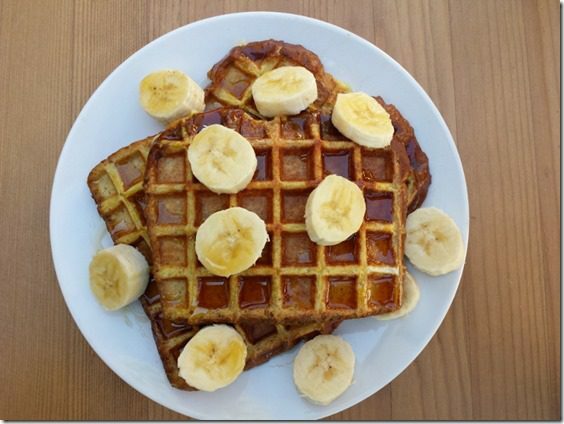 Check out this waffle maker with removable plates – so easy to clean! That’s the one I usually use. I topped mine with bananas and maple syrup. It was the best and easiest waffle recipe ever! Question: Do you own a waffle maker? 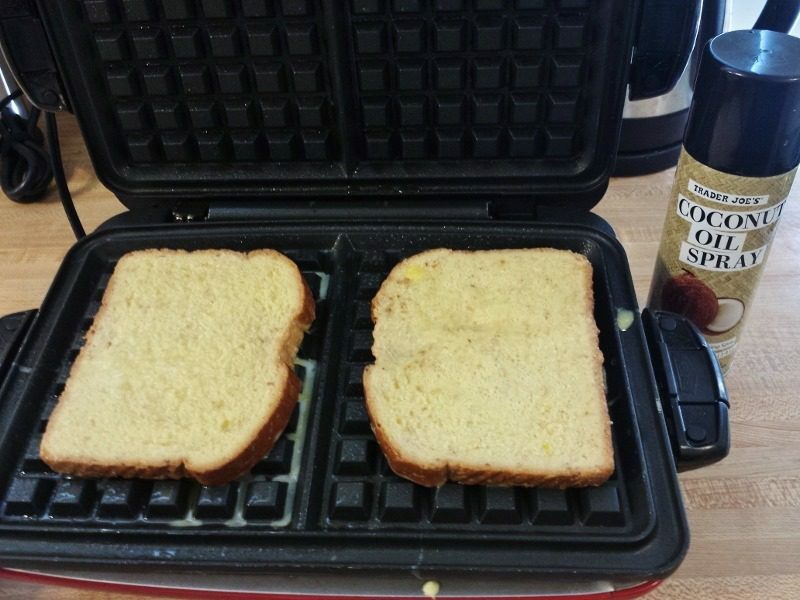 Did you know you can make grilled cheese sandwiches in the waffle iron? i haven’t made FT this way, but when i saw your post title i thought it was gonna be something i have done.. french toasted waffles. basically take left over waffles and dip them in FT batter and then cook them in a pan. granted, your way is a zillion times easier, but the other kind are good, too. 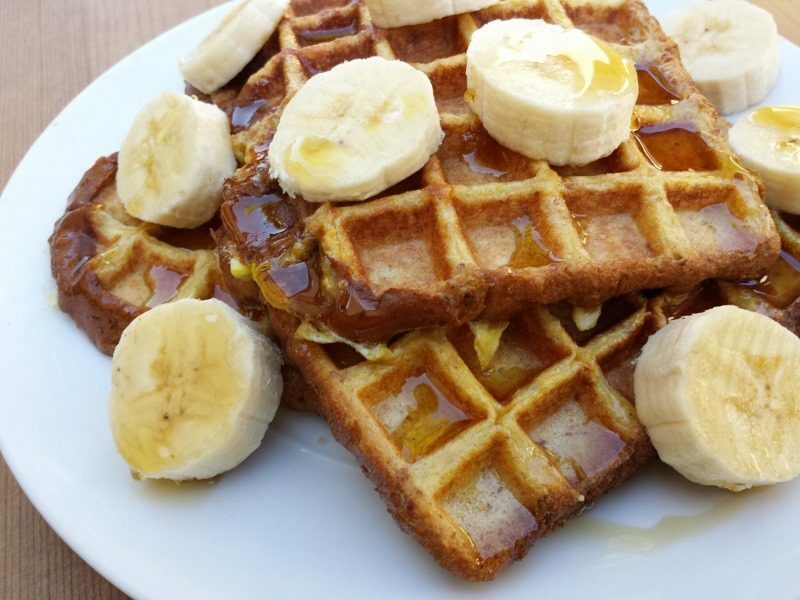 Those “waffles” look amazing! What a Genius idea! I made these for dinner tonight- Holy Yum! I used costco gluten-free bread and topped them with low-sugar homemade strawberry jam. Delish! Those look amazing!! I can’t wait to try some “waffles”! What a fantastic idea! 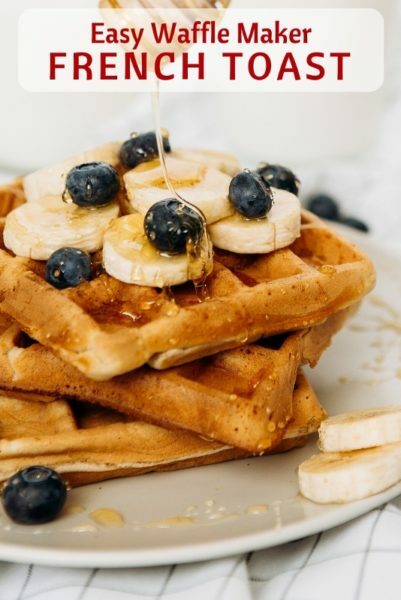 Definitely want to make these waffles for breakfast this weekend! This is genius beyond genius. Like Nobel prize worthy genius!!! Score, I have a waffle maker! I don’t know why I never thought to do french toast waffles before but it’s so going to happen now. These waffles look amazing! I can’t wait to try them. As for post-race munchies, I too am a victim. In fact, I recently ran my first marathon and I woke up in the middle of the night with my tummy growling 🙁 I don’t limit my calories after big runs like that either. 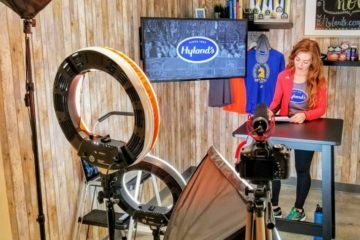 I love food so much, but if there was a way to avoid post-run hunger I would definitely get in line! They look delicious! I might have to try these. I don’t have a waffle maker but will have to get one now. Fun! I don’t have a waffle maker and honestly can’t remember the last time I ate a waffle. YUM! I think you convinced me now to have breakfast for dinner. Congrats on finishing your marathon! I don’t own a waffle maker but wish I did! Man, I LOVE that idea! I do have a waffle maker. It’s pretty small and is able to be stored on-end like a book so it’s pretty space efficient. I love it! 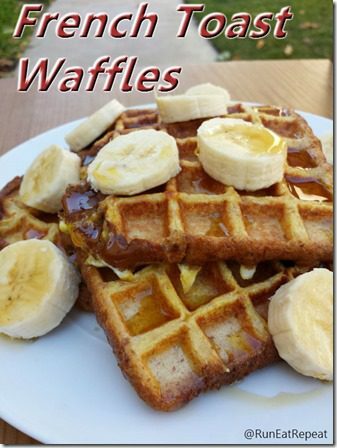 Such a great waffle idea and so easy! That idea is genious! Although it still means I have to clean the waffle iron which is my least favourite job! Agreed. A waffle maker that let’s you just pull off the waffle tile parts (I don’t know how to talk clearly) and dishwasher them is my dream wafflemaker. omg French toast waffles! And so easy, too. Now I just need to get a waffle maker. Those look delicious! And ridiculously easy. I do own a waffle maker…I won it from somewhere a while ago. Also, I quote Rolly from 101 Dalmations all the time! His spiel is basically my motto. Fabulous idea!! Can’t wait to try 🙂 What kind of waffle maker do you have? Looks legit. It’s actually a Foreman grill with the waffle maker panels! Such a good idea! I totally need to bust out our waffle maker and try these out! Thanks for the inspiration! That is an awesome waffle maker! I really need to get a waffle maker these sound so good! GENIUS — seriously. What a fantastic idea!! I don’t own a waffle maker but, I want one now! Lol question for you! I noticed you use coconut oil spray (I only use coconut oil to cook anything) I didn’t realize there was such a beast… Where can I find it?! I got that from Trader Joes. I bet they have it at similar stores too.